MASSIVE PROTECTIVE STRUCTURE COMBINED WITH SOPHISTICATED OPERATOR FEEDBACK. 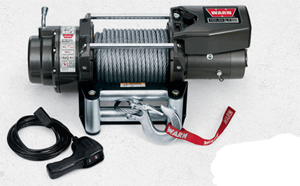 • Gen II, series-wound motor and 3-stage planetary gear train deliver 9,500 lbs of pulling capacity, fast line speed and long duty cycles. 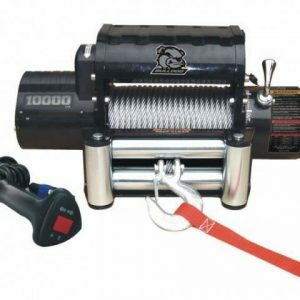 • Extreme duty winch sealing system. 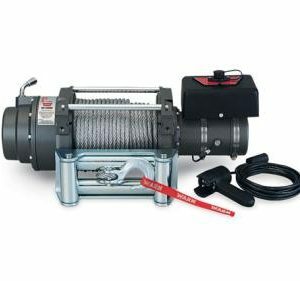 • Motor-mounted thermal sensor relays temperature information to winch operator by way of the hand-held remote control with LED indicator. • High-gloss, chip-resistant gray powder coat finish over a massive cast aluminum alloy housing. 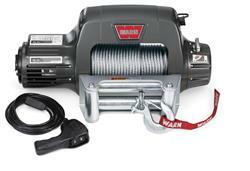 • Comes with 125’ of 5/16” wire rope, hook, remote control on 12’ lead, clutch and roller fairlead.